Do Good As You Go -Muskoka Foundation gave us the introduction to begin Working with Fundacion Construyendo Suenos, Bogota, Colombia. Working with rural communities outside of Bogata in villages known as San Javier and San Joaquin y el Municipio de la Mesa. 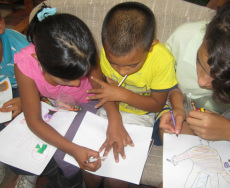 It is approximately 2 hrs from Bogota and we created family and community building art lessons - working with the entire family unit and creating an art project that involves multiple generations, working on specific areas to increase the positive dynamics of the family unit and bringing together entire communities. We continued our Highwire mission in bridging the cultural gaps through lessons of hope and love with the children of the village, and learned so much of their dreams. It was a powerfully moving trip with openness from grandparents to children as young as 6.